If you want to buy the best Headphone Amp under 100 Dollars, then you'll LOVE this guide. Hence you'll see; I won't be mentioning ​amps close to $100 but rather starting from $30... up to $80. However if you're looking for much Headphone Amp and full-fledged DAC; I'd recommend to check my previous guide about it. So without wasting much time, we'll get straight into the important part of this post. Well to start off I thought I’d rather put a small and highly portable headphone amp; hence the people who just want to have a small and the best portable headphone amp won’t have to go through the entire list. At price of $30, it certainly deserves to be in our list of Best Headphone Amp under 100 Dollars because it ticks all the right places. It’s very small with a size that of a matchbox and can power two headphones at the same time; which I believe is totally awesome. Brainwavz AP001 design is pretty unique compared to the best portable headphone amp I’ve used or seen. There’s a keyhole kind of design at centre which houses LED indicators inside it. ...and offers 120% increase in original sound output. It has 12 hours of battery life and gets full charged within 2 hours. Brainwavz AP001 supports frequency response of 16-100K Hz and all this packed in a weight of just 15 grams. "What more could you expect from a best Headphone Amp under 100 Dollars which offers Dual Headphone support, high frequency response and very small design all for a price of just under $30." The only problem one could face is the battery life of just 12 hours, making it required to charge every 3 days. ...then Fiio E07K is the way to go. The way this best portable headphone amp is designed makes it looks like a Portable Music Player with an OLED display and Button at its sides with glass finish at the front. However it’s just a Headphone Amp and DAC with OLED display as an added advantage. ...and the E07K is its proud product. The best part is... with an OLED display, this headphone amp allows you to adjust your sound as per your choice. Hence you can adjust controls regarding Bass, Treble, Balance and Gain Level Adjustment from 0, 6 and 12 dB. Design wise it has brushed aluminium finish all over the body just like the Fiio A3 and Glass Finish at the front with only a small portion containing the OLED display. ...whereas the right features a Hold Toggle; all the buttons on Fiio E07K have a Silver Aluminium Finish. At top it has two Headphone Jacks whereas the button features Mini USB port and a slot that lets it dock to Fiio E09K. For users looking for technical features, then this headphone amp supports impedance from 16 – 150 Ohms and for audiophiles, the good news is it provides 96kHz/24-bit signal which means you can expect audiophile grade sound from it. "Expect the low impedance support, Fiio E07K Andres definitely deserves to be in our list of best headphone amp under 100 Dollars and it offers excellent features with a touch of style." Topping may not be a renowned brand but its Headphone Amplifier NX1 and NX2 are making pretty good noise recently. Quality Promise-NX2s has CE, FCC and RoHs certification and exceeds the requirements of Hi-Res Audio. NX2s uses OP(OPA1652)+BUF（LMH6643）structure to increase output power to 140mW x2(32Ω)maximum power, suitable for all kinds of headphones. Thinner and Lighter-with the height of 9mm and the weight of 74g, it can be more convenient. Long Working Time-Built in 1000mAh, provides 40 hours playback time. If you look at the images, you can easily say that it’s very slim for a Headphone Amp that works also as a DAC having length of 11cm which doesn’t make it entirely portable. The battery is what increases its size. As you can see, Topping NX2 isn’t the best looking Headphone Amp out there because it retains that industrial design which gives it a professional look. How much Headphone Impedance does it supports? Upto 300 Ohms; which is an ideal choice unless you’re going for Beyerdynamic DT880 Premium. Though it doesn’t comes with features like Dual Headphones Support or Built-in Mic it definitely provides what it says. Also check what other users have to say on via this forum thread. The company also includes two silicon band and 5 velcro pieces so as to attach it behind your smartphone. Though it’s just a fix rather than a solution, so be careful before doing it. "My last words would be... the Topping NX2 is not your fancy Headphone Amp but it does what is marketed and hence is featured in our list of best Headphone Amp under 100 Dollars." 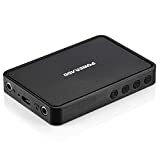 Creative is a renowned brand when it comes to audio products and Creative Sound Blaster E1 is their best products in best headphone amp category and hence in featured in our list of best Headphone Amp under 100 Dollar. ...but don’t get fooled as it packs whole awesome hardware inside. Compared to previously mentioned Brainwavz AP001, the Creative Sound Blaster E1 is a major step with 25 hours of battery life and support for 600 Ohms of Headphone Amplification. This is serious business for a price just over $30. ...moreover it also has a built-in mic which can be used to receive/end calls. The E1 also has shirt clip at the back and can be easily taken anywhere considering it weighs only 25 grams. I like the fact that Creative provided bright Orange Stereo and USB cable inside the box which can quickly grab attention. The best part is you can even the E1 as a DAC and connect it to your PC as an external sound card. "All-in-all the Creative Sound Blaster E1 is an excellent product for best headphone amp under 100 Dollars with 25 hours of Battery Life and support for 600 Ohms Headphones and built-in mic support." You just cannot go wrong for the price just over $30 you spend on these. 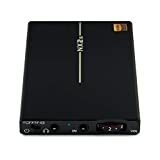 There are few products that I see on Amazon.com with a complete 5/5 stars and Poweradd Headphone Amp is one of it. Now it’s not as fancy as other Headphone Amplifier in our list but it does have a good design if not great with a full plastic body and weighs only 55 grams. It offers support to headphones with Impedance from 8 Ohms to 600 Ohms which is highest among other amps mentioned in the list. This best portable headphone amp also features Bluetooth 4.0 with AptX which allows you to wirelessly connect it to your smartphone via Bluetooth and enjoy your music. However I’d do like to mention an important point... this headphone amp connects wirelessly to your smartphone via Bluetooth, but to connect it to your headphones you definitely need to do it via Stereo cable. It comes with a 1300 mAH battery which can this portable amp alive for upto 60 hours... whereas to save some juice you can even connect your smartphone to this amp via AUX cable to save some juice. Lastly I would like to conclude by saying that the Poweradd definitely deserves to be in our list of Top 5 Best Headphone Amp Under 100 Dollars with the feature company is offering just under $40 which makes it solid buy. I believe you must have unlocked the Best Headphone Amp on #1 position? If you haven't done it till now, I strongly suggest you to do it. This helps you let your friends know on social media the kind of awesome content you're reading online. ​So why not show it to them? It may also help, if they're too looking to buy the Best Portable Headphone Amp under $100. However, I do hope you enjoyed this article. I'd be filled with awesomeness if this guide helped you zero on your next Headphone Amp.